Buick is one of the oldest U.S. car brands manufactured in the U.S. It was a popular luxury brand in the 1950s and 1960s. It continues its popularity to this day. It has a classic, unique styling that is distinctive regardless of the year or model. Buick is a brand that can be found now worldwide. Each of our Buick convertible tops is manufactured to original pattern specifications and we offer the original fabric selection. Our Buick convertible tops will instantly renew your vehicle to show room condition. 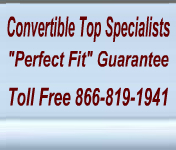 We offer a complete line of convertible tops, Buick convertible top cables, Buick convertible top pads, Buick convertible top boots and Buick convertible top headliners. Our convertible tops will fit all of the Buick convertible models manufactured in the U.S.